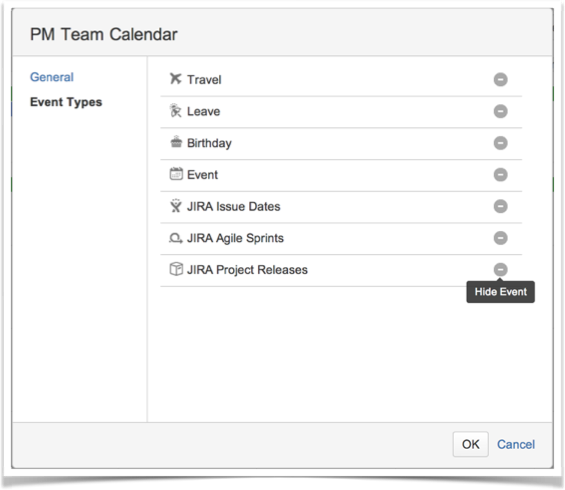 The Atlassian Team Calendars team is pleased to announce the release of Team Calendars 4.4. This release focused on making it easier for you to show/hide different event types on your calendar. Only users with edit permission to that calendar can modify its event types. Alternatively, download the latest release from our plugin exchange and install it via the Plugin Administration screen. This should upgrade Team Calendars to 4.4 (or higher). If you run into any issues, to down-grade simply install an the previous version of Team Calendars you were running (also available from the marketplace).